The Antarctic Pavilion brings together leading international architects and artists to explore present and future models of living with Antarctica. Almost without exception, Antarctic stations are designed by engineers with minimal aesthetic regard for living conditions. How does their pseudo-architecture circumscribe man’s relationship with the continent? More importantly—What are the alternatives? 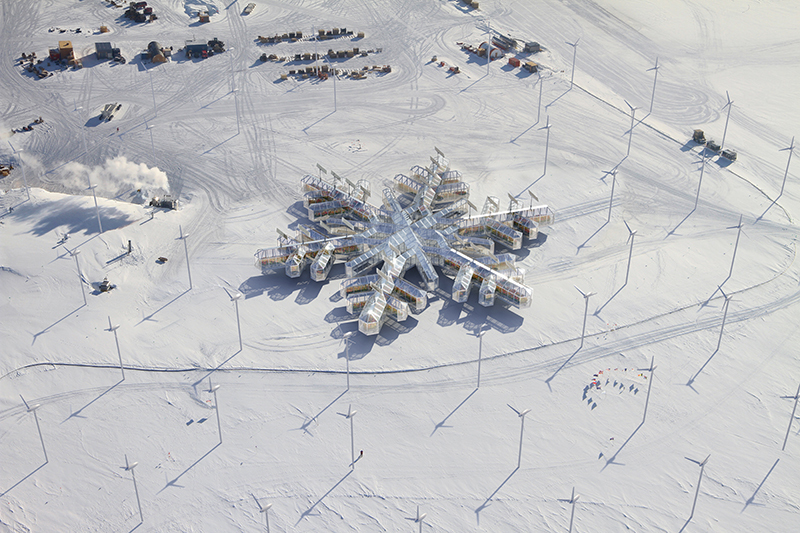 The projects featured in this pavilion are directed towards other pasts, presents and futures whose relevance and power transcend South Polar geography. They propose an expanded Antarctic imaginary. The overall scenography of the exhibition has been designed by Alexey Kozyr architectural studio. It invokes the provisional nature of architecture in Antarctica – as well as the logistical reality of having to transport all building materials into the continent. A series of flight-cases, of same kind used to transport scientific equipment, will act as plinths for maquettes by contributing architects. The Antarctic Pavilion is a long-term project, initially focused on alerting the architectural profession to its disregard for what is built in the South Polar region. In time, our program will impact upon the design of real stations. The Pavilion’s status as a ‘[trans]National Pavilion’ also constitutes a polemical engagement with the Biennale’s nationally over-determined structure: a quasi-institutional claim to represent a transnational sphere, out of line with the festival’s politics of territorial representation. More importantly, it points to Antarctica as a Giardini of sorts, in which the sovereignty-obsessed cultural ambitions relevant two centuries ago still seem to hold sway – for the worse. Despite all the kilometres of ground untrodden by human foot, mountains unnamed and creatures unknown, Antarctica is a cultural space. The projects featured in this pavilion are testaments to the Antarctic community that would yet know itself – and the continent – in ways transcending national-scientific missions. Among enthusiasts and unbuilt schemes dwells the promise of a new Antarctic man. The Antarctic Pavilion is initiated by the artist Alexander Ponomarev. Drawing upon his background in nautical engineering and early career as a submariner, Ponomarev’s work chiefly invokes journeys at sea and remote terrain – contexts in which to explore the relationship between illusion and reality, the utility of art, and the shifting tides of personal and cultural history. Ponomarev is a regular visitor to Antarctica, and has realized numerous projects on the continent. The Antarctic Pavilion draws upon his longstanding interest in Antarctica’s potential as a cultural field. The Antarctic Pavilion is a European interface platform for a biennale to be held in Antarctica, also devised and implemented by artist Alexander Ponomarev, and curated by Nadim Samman. The Antarctic Biennale will be take place in 2015-2016 aboard international research vessels. The Antarctic Biennale is conceived as a cultural exchange between artists and the continent’s scientists and support staff.